There’s something about a great, simple, outdoor session. It feels All-American, and a big nostalgic. There wasn’t a better fit than Jackson for a session like this: he’s a no-nonsense, kind, and interesting young man, and he loves the outdoors. I really enjoyed meeting his older sister a few years ago, and doing her senior photos as well. Hunting and fishing are two of his favorite past-times, and he also enjoys anything that has to do with Jeeps or old cars. He started his own mobile detailing company this year, and it’s going very well (what an entrepreneur!). 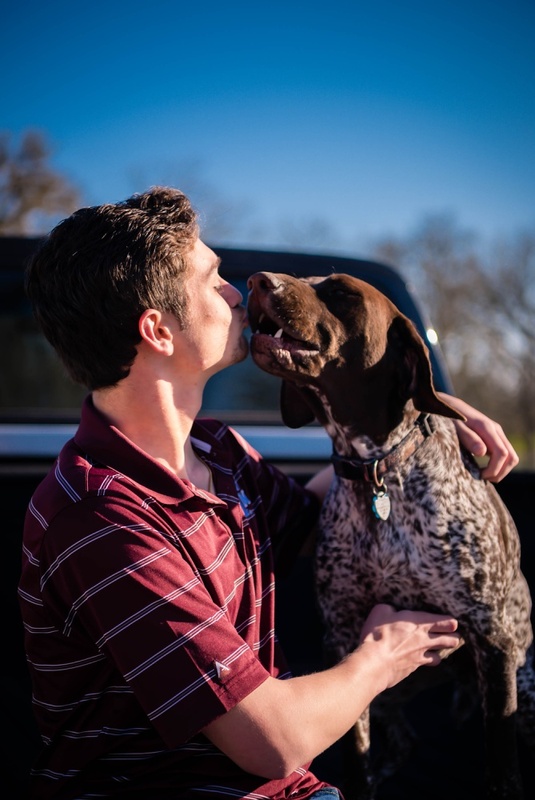 In his spare time, he enjoys being with his friends, and training his dog Goose (who is pictured) to be a hunting dog. Lastly, he spends time volunteering in the PALS program, which matches older students with younger ones in order to be mentors and role models. We chose an outdoor location with pretty trees and a small body of water, and we were blessed with blue skies when we met up. I wanted him to be able to have plenty of room to include his beloved dog, and to also show off his truck. Jackson is heading for more exciting adventures after graduation, and I hope to be front and center to watch his endeavors. Some people really love the outdoors, but others prefer an urban, downtown look for their personal style, or to show off a hobby or idea. I love showing off whatever you have in mind, and planning your shoot accordingly. The 4-1-1 on Summer Jobs! 1) Spruce up your resume: You can use a free design program like Canva to create a beautiful template type resume and then fill it in with your own information and images. It is NEVER a good idea to lie on a resume. Not only is it unethical/illegal, it could cost you your job and hurt future opportunities if your boss or HR found out that you had written down experience or education that you didn't have. Instead, be sure to expand upon anything you have accomplished, such as scholarships, babysitting experience, even housesitting or volunteer work. You want to demonstrate a strong work ethic, with reliable sources. Make sure you also list out relevant skills like microsoft word, Excel, typing speed, speaking other languages, etc. 2) Find great references: Your bestie may be your brunch buddy and shopping partner, but they may not be the best job reference. You want to list people who are able to speak about your character or your work ethic. If you've never had a job before, consider teachers, ministers, or school officials who may be able to eloquently outline character traits and things you're good at. Make sure you ask permission before listing anyone on your resume and giving out their contact information. 3) Don't fall for scams: Don't ever go on a job interview without telling someone else where you are going. Don't go to any jobs that lack a real description, or appear to be vague. Don't ever sign anything you've not read thoroughly, and show your parents any paperwork that is given to you before signing it. Jobs that say things like "modeling gigs" or "nannying" (especially on Craigslist with anonymous numbers listed) can be scams, so make sure you check out any websites, associated phone numbers, etc, before you go to an interview. 4) Network where you are at: Asking around your local church, school, or places of business are all great ideas. If you're wanting a job in a specific field (such as a dentist office or a clothing boutique), it can be beneficial to find someone who has worked for a long time in the industry and ask them if they might have leads for you. Local connections are also ideal because they are face to face and help you avoid falling into any scam ads or things that look "too good to be true". You can even keep copies of your resume in your car if anyone wants to see it. 5) If you cannot find a regular summer job, get creative: If you have a special skill, think of ways to use it to earn money. Some examples would be: tutoring family or friends in reading or math skills, teaching singing or violin lessons if you play an instrument or sing, writing for a local newspaper if you have strong writing skills, teaching art or craft classes for young children. You may be able to find enough side jobs to earn a little extra money. Doing side jobs is also a great way to keep a more flexible schedule in the summer.